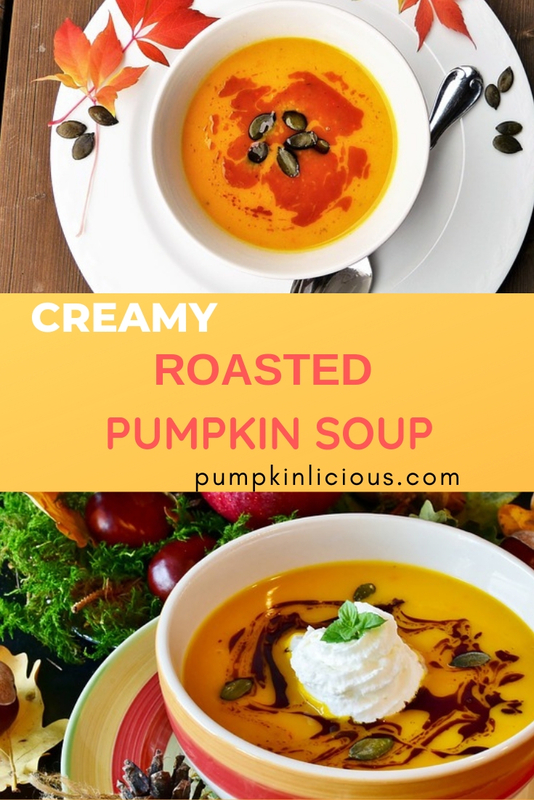 This is the easiest possible recipe for creamy roasted pumpkin soup! Made with roasted pumpkin and with lots of variations. I virtually live on pumpkin soup in the winter. It is the most comforting, warming, satisfying and filling lunch, supper or dinner imaginable. I have a friend who even eats pumpkin soup for breakfast! I draw the line at that one. But it is one of the healthiest foods you can eat. This is an easy pumpkin soup recipe using roasted pumpkin. The roasting process helps bring out the natural sweetness of the pumpkin and gives it an almost caramelized flavor. The orange color is very cheery on a cold winter’s night. Or even a miserable, rainy and dull summer’s evening which tend to happen quite frequently during winter! So, to make sure I have a never-ending supply, whenever I put the oven on I put a pumpkin into roast as well. The added flavor of roasting the pumpkin is so worth the wait. If you are a meat eater and roast the pumpkin with a joint, or a chicken, it gives an added richness too. And you can make a stock or use some of the gravy to add to the soup too. I don’t bother cutting the pumpkin up very much. Either in two halves or maybe in slices and take the seeds out. Give the whole thing a rinse under the tap in case there is any soil on the outside. And that’s it. Once you have your roasted pumpkin – it takes about 40 minutes in the oven – let it cool a while until you can handle it easily. Or you can put it in the fridge and make the soup the next day if you want. When I’m ready to make the soup, I’ll take whatever vegetables I have in the fridge and fry a few up for flavor in olive oil. It might be a leek or a couple of spring onions, or an onion and some finely chopped carrot. Celery is another great one for adding some flavor. Personally, I adore garlic so I’ll add a couple of roughly chopped cloves while I’m gently frying up a few veggies in the fragrant green extra virgin olive oil that I love from Spain or Italy. I do this directly in a large soup pan, but you can use a frying pan and transfer the gently fried vegetables into a soup pan once they are soft. Then I’ll scoop the pumpkin flesh out and add it to the pan, and fill it almost to the top with any chicken or meat stock or gravy I have left over and some boiling water out of the kettle. If you are vegetarian, just add a vegetable stock cube and water instead. This recipe for pumpkin soup is also gluten-free! Give it all a good stir so that the pumpkin starts to break down in the water. Bring to the boil and simmer gently until the pumpkin is broken down and smooth. What makes my favorite recipe for pumpkin soup so easy is that it really doesn’t need to be liquidized unless you like your soups very, very smooth. I usually have a few spinach leaves growing in the garden, so I’ll wash a few, tear them up with my hands and throw them into the soup for the last couple of minutes until the leaves just soften. Fantastic for getting some iron and vitamins into you, and it gives an added touch of texture and color too. And that’s it. So easy. Enjoy a bowl any time you like, on its own or with a big chunk of bread. It freezes perfectly, so put a few portions into the freezer so it’s always on hand for a great meal when you are in a hurry. Lentils – for a hearty vegetarian pumpkin soup, add a tin of lentils, chickpeas or beans. Chicken – if I’ve roasted a chicken, I’ll often pick the last bits of meat off the bones and add that to the soup too. Bacon – when frying your vegetables add a couple of slices of chopped bacon or ham. Spices – if you like your food spicy, add a spoonful of curry powder, or cumin, or half a teaspoon of ginger. Herbs – rosemary, thyme or sage go really well with this soup. Chop them at the last minute and add them at the end, so you get the freshest flavor through the soup. 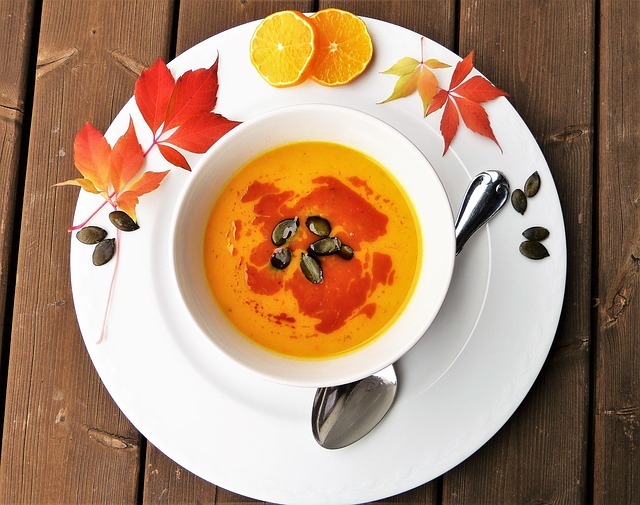 Zesty Pumpkin Soup – pumpkin soup with a KICK! 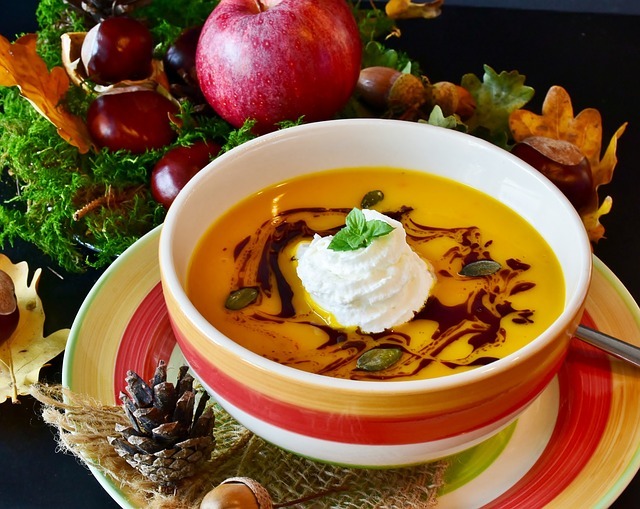 What would you add to your Creamy Roasted Pumpkin Soup?